Multipurpose rutile titanium dioxide with excellent optical features, good ability to disperse and very good price. We can recommend this white pigment mainly to paints industry - for adulterate coating compositions and also for coating compositions made of solvents, further to plastics industry - to dye through PE, PVC and PP substances. Packing - 25 kg multiply paper bags with PE lining, 1 pallet / 1000 kg, shrink-wrap, big-bags 500-1500 kg, weight upon request of customer. Titanium dioxide KTR 720 is titanium oxide TiO2, rutile type produced by sulphate method with a classic surface treatment Al+Si. Surface treatment by aluminium oxide (alumina) and silicon oxide (silica) improves stability and dispersion under the given conditions. Titanium dioxide is insoluble in water and also in a solvent organic, it is very stable and chemical inert. No toxic effects are known up to now. 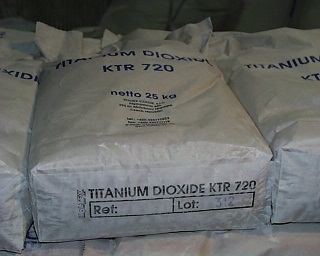 Titanum dioxide (TiO2) is best known white pigment. TiO2 has ability to scatter light and also can absorb energy of UV light. These facts influence its properties and widen its possibilities to be used in lot of different applications. Titanium dioxide is available in two crystal forms: 1. rutile, 2. anatase. Advantages of rutile TiO2 to anatase one are following: higher refractive index; better light-scattering; superior weather-resistance properties. Multipurpose rutile titanium dioxide with excellent optical features, good ability to disperse and very good price. We can recommend this white pigment mainly to paints industry - for adulterate coating compositions and also for coating compositions made of solvents, further to plastics industry - to dye through PE, PVC and PP substances. We have constantly in our stock 10 different types, common cheap technical types or top extremely white talcs. Many other types after your special order. We are able to find a suitable substitution for better price.